Habeetats nesting shelters for solitary bees. Manual and list of beneficial garden plants included. Why do we need Habeetats and solitary bees? The rapid decline in honey bees due to Colony Collapse Disorder (CCD) calls for a change in the way we pollinate our gardens crops. Fortunately, opportunity hovers right before our eyes. Solitary bees make up more than ninety percent of all bee species and are unaffected by CCD. By providing Habeetats nesting shelters for these gentle and vital creatures we can tap into an abundant source of sustainable pollination. Get wicked smart and check our short animation below to learn why helping to increase pollinator diversity is important for you and generations to come. Habeetats would be nothing short of an empty promise without its inhabitants. Take a few minutes and get to know the bees. Consisting of over three hundred species, Mason bees (Osmia sp.) thrive anywhere from Tokyo to your backyard. They live up to their name by making skilful use of mud and clay as they prepare their nests. Leafcutter bees (Megachile sp.) is one of the largest families of solitary bees. It consist of more than 1500 species. 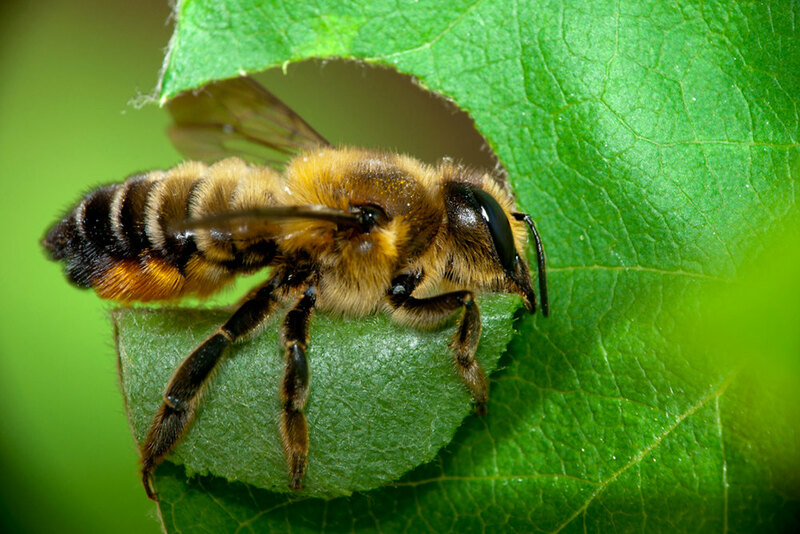 Leafcutter bees use circular cuts of leaves to line their nests. Forget about queens and workers. Solitary bees are all born equal and every female is fertile and makes her own nest. These little but potent creatures are also gentle by nature and only sting if squeezed or stepped on. There are also no known instances of people eliciting an allergic reaction to solitary bees. Solitary bees are therefore both beneficial to your garden and safe for children and pets. A) Do solitary bees produce honey? Solitary bees do NOT produce honey but they are superb and efficient pollinators. Solitary bees are vital for the pollination of both wild and garden plants as well as for agricultural crops. B) Are solitary bees as good as honey bees at pollination? Yes! In fact, there are many examples where solitary bees are better than honey bees at pollination. Some crops can be pollinated entirely by wild bees and without the addition of honey bees, but this is only possible if the habitat needs of the wild bees are met. Wild/solitary bees need floral resources and undisturbed nesting areas. B) Are solitary bees included? Although it is technically possible, solitary bees are NOT included with your Habeetats nesting shelter. This is a decision of responsibility to keep the bees as healthy as possible. Transporting and moving bees from one place to the next increases the chance of introducing parasites or disease to the local population. While nests can be cleaned, microscopic fungal spores can remain and parasites living inside of the cocoon or within the bees could go undetected. C) My next door neighbor has bees in her nest. May I transfer some of her bees to mine? Yes. But wait until the end of the summer. When you open up the nest you will see a row of cocoons. The cocoons toward the opening are male bees while the cocoons toward the back are female. Be gentle when you remove the cocoons. Discard any unhealthy or paracitized cocoons (you'll know it when you see it). Transfer healthy cocoons to cigarbox or similar wooden box with 8mm hole (they need air) and store in garage or on balcony. When spring comes place box with cocoons on top of your nest and secure with string. New batch of healthy bees will emerge when avg. temperatures reach 10 C. When the bees emerge next to your habeetat they will automatically make this their new home. C) How do I help wild bees? The availability of natural habitat is a major limiting factor for wild bees. You can help! Boost your bee population by providing suitable nesting habitat and a diversity of plants to serve as a continuous food source through spring to autumn. Habeetats nest provide a nesting site for solitary bees that would otherwise nest in holes in plant stems, between rocks or in even between bricks. To help you get started, a manual and a comprehensive pollinator plant guide for increasing backyard biodiversity are included with each Habeetats nesting shelter. D) Why is it important to clean the nests? Cleaning the shelter reduces the buildup of nesting material which means less work for the bees but most importantly it reduces the buildup of parasites and disease. Habeetats nesting shelters are designed for easy disassembly, nest inspection and cleaning. Ideally, the shelters should be disassembled and cleaned once a year. We encourage you to take good care of your bees. E) Do I need any special protective equipment? No! Solitary bees are peaceful pollinators. It is extremely rare for them to sting, even if squeezed. Also, there are NO known instances of a solitary bee sting eliciting an allergic reaction. Solitary bees are safe and perfect companions for both children and pets. D) How many solitary bee species exist? Of the 25,000 different bee species worldwide about 90% of them are solitary! In Denmark alone there are ca. 250 species of solitary bees. 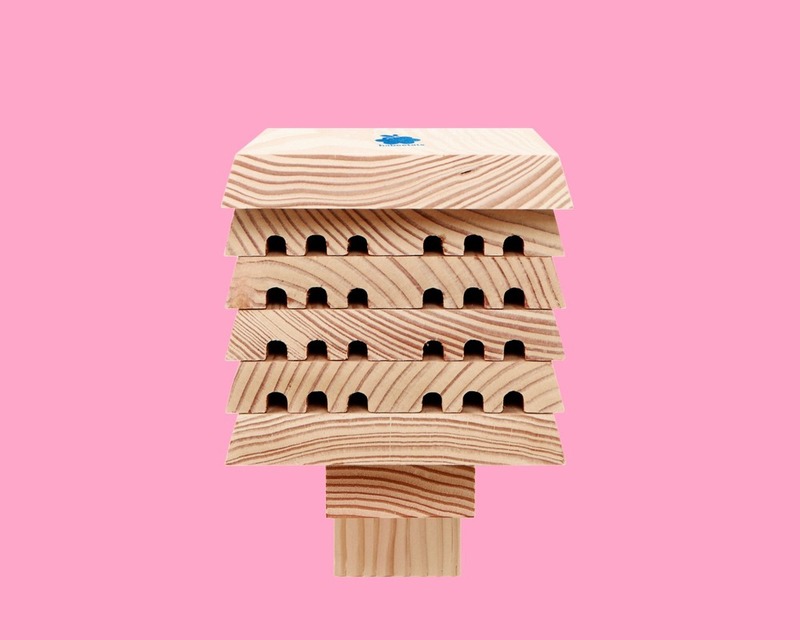 Founded by André Amtoft, Anja Amtoft Wynns and Hans Peter Blichfeldt Dinesen and designed by architect Jeppe Utzon, habeetats home nesting shelters are based on prototypes developed and field tested by biologist and solitary bee expert Anja Amtoft Wynns. Our large habeetats nesting shelters are designed by architect Henrik Ingemann Nielsen for use in orchards and the agro-industry. Habeetats nesting shelters accommodate Osmia (Mason) and Megachile (Leafcutter) species and have been scientifically tested and dimensioned to ensure an equal male to female ratio for population growth. They are easy to mount, assemble and inspect and therefore also a great way to learn about the wonders of pollination. Each nest comes complete with an easy step-by-step manual and an extensive list of beneficial garden plants. Habeetats nesting shelters are handcrafted in Denmark. Naturally we enjoy all things sustainable and therefore source our Dinesen Douglas Fir directly and locally from Dinesen's sawmill leftovers in Southern Jutland. Habeetats wouldn't have been possible without our wonderful friends: Agga Stage (art direction), Tobias Lund (illustration), Jesper Olsson (illustration and animation), Rikard Sundelin (copywriter), Jens Jacob Blichfeldt Dinesen (photographer), Christina Birch (photographer), Thomas Dinesen (dinesen douglas leftovers).